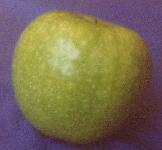 Large, round, firm, grass green apple that originated in Australia around 1870. Sprightly semi-tart flavor good for fresh eating, juice, and cooking. Excellent keeper. Ripens in early November in the Willamette Valley.